Abstract: Cordilleran batholiths are generally considered to form beneath arc terranes in thickened crust, but a survey of modern continental arcs reveals most to be regions of normal to thinned crust, not zones of crustal thickening. Thus, the origin of Cordilleran batholiths is enigmatic. I suggest that these batholiths form mostly during and after arc-continent collision as the result of slab failure. Slab failure is a natural consequence of arc-continent collision, and explains the age difference between continental and oceanic lithosphere, because oceanic lithosphere is readily subducted, whereas continents are buoyant and difficult to subduct. Once the subducting slab tears, rocks of the partially subducted continental margin rise due to buoyancy and the collision zone is exhumed. The failure also allows asthenosphere to upwell through the tear, melt adiabatically, and rise into the collision zone, where it interacts especially with subcontinental lithosphere and crust of the upper plate. Slab failure magmas are geochemically and isotopically distinct from arc magmas because slab failure magmas form from melting of garnet peridotite whereas arc magmas are derived from melting of spinal peridotite. Cretaceous exmples of slab failure magmatism include the La Posta and Sierran Crest magmatic suites of the Peninsular Ranges and Sierran batholiths, which formed due to closure of the Bisbee-Arperos seaway, a marginal basin that opened along the western margin of the Cordilleran Ribbon Continent at about 135 Ma and closed at ~100 Ma. This seaway likely extended from southern Mexico to the Arctic ocean. Slab failure rocks of the 125-105 Ma Sevier event, which occurred in the Great Basin sector of the US, outcrop in the Omineca belt and Selwyn basin of Canada where they were transported after 70 Ma during the 82-58 Ma Laramide event. The Laramide event also had a period of slab failure magmatism that extended from southern Mexico to Alaska. Slab failure magmas were emplaced into a zone of uplift and exhumation in the Sonoran batholith of Mexico and Arizona, the Transverse Ranges of southern California, the Idaho and Boulder batholiths, and the Coast Range batholith of British Columbia. Most of the Cretaceous plutons in the North American Cordillera appear to be slab failure bodies, not arc plutons. Commonly associated with slab failure magmatism are porphyry Cu±Au deposits and Li-Cs-Ta pegmatites. Lastly, most of the world's diamonds may owe their origin to subduction and foundering of carbonate on subducted continental margins. 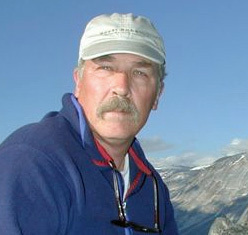 Bio: Robert Hildebrand is a field geologist who grew up in Marblehead, Massachusetts, and spent his first complete summer working in the high Sierra in 1971. He received a B.A. in geology at UC Santa Barbara and a PhD from Memorial University of Newfoundland. He spent 20 years mapping in the Northwest Territories of Canada for the Territorial Government and the Geological Survey of Canada where he was a research scientist. Subsequently, he managed gold exploration projects in Venezuela, Mexico, and the Dominican Republic. About 10 years ago he turned his attention to the North American Cordillera and has published his research in several journal articles and two stand-alone GSA special papers on the Cordillera. Hildebrand is a Fellow of the Geological Society of America, was a Visiting Scholar at the University of Arizona and is currently a Research Associate at the University of California, Davis.